Yesterday marked nine years since the death of Fred Rogers. Known to most as simply "Mister Rogers," Fred was a man who inspired innumerable people - children were his main audience, but it was hard for people of any age to not be inspired by this kind, soft-spoken man whose message was entirely about self-confidence and love. All I can say is, it's worth the struggle to discover who you really are and how you, in your own way, can put life together as something that means a lot to you. From time to time, I find myself dipping into the book, a collection of short thoughts and anecdotes, for inspiration and motivation. And it absolutely never falls short of perfection. Such a lovely person, no? It had me thinking about you, reader. And about my family, and my friends. And all the people who have been there along the way as I have worked to create the person I am today. And how endlessly thankful I am to have such love and support. 1 - Post a comment here completing this sentence: "The person/place/thing I am most grateful for on my journey is..."
3 - Post the following on Twitter: "I'm entered to win @oh_mg's Mister Rogers giveaway on asmallloss.com - you should be too!" You have until midnight on Thursday, March 1, to enter; I will announce the winners in Friday's Roses and thorns. Good luck! The person I am most grateful for on my journey (not only weight loss, but in life too) is my mom. She's always been there to cheer me on. 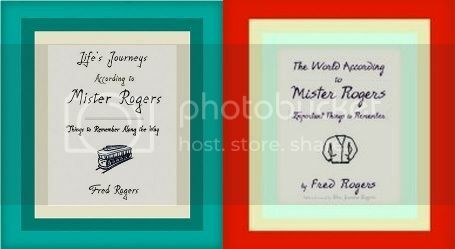 Great giveaway--I love Fred Rogers! The person I am most grateful for on my journey is my boyfriend, Pete. He is my cheerleader, my motivator and my official recipe tester. He is so encouraging and never lets me doubt myself. Finally, I tweeted about the contest. What a cool thing to do! The thing I am most grateful for on my journey is my blog. I have so much support... I can vent... I have a place to just tell it how it is. I don't think I would of gotten this far without it. The person/place/thing I am most grateful for on my journey is my husband. He is the most supportive, encouraging person I know. This is a great giveaway, Mary. I used to watch Mister Rogers frequently when I was little! The thing I am most grateful for on my journey is my perseverance. I've tried taking the easy way out before and finally something clicked that told me I am worth it. It's definitely not always easy but oh so worth it. "The person/place/thing I am most grateful for on my journey is...my husband. We have had some speedbumps along the way about what he says or brings into the house, it has been a learning experience for both of us, and now I know that as long as I speak up, that is all it takes for him to change his behavior and be completely supportive!" How great of you to do a give away!!! I can't enter cuz I dont tweet :-) But I would like to to say that I am most grateful for my husband. Yes, corny. But he is my best motivation. And he NEVER cancels on me when it comes to a workout date...which is more than I can say for any other "workout buddy" I have ever had! The person I am most grateful for along this journey is actually me. It was me that went to the doctor initially, it is me that chooses to eat healthy, and it is me who chooses to exercise daily. My husband also plays a huge part in my success as a cheerleader and support system. The person/place/thing I am most grateful for on my journey is myself. I finally found the willpower/courage/motivation to get off my a** and make a positive change in my life with my health and weight. Next month I celebrate the one year anniversary of MY new life that I've created. I am most grateful for my bed. It's a place of rest, rejuvenation and my safe place to hide when the world is getting to me. Thanks for your blog, you inspire me! The person I am most grateful for on this journey is ME. I am glad I made the decision. I am proud of My hard work. I pick myself up when I am down...and reward myself for doing the right things. "The person/place/thing I am most grateful for on my journey is..." This may sound crazy but it's me. I encourage and cheer for myself more than anybody. The person I am most grateful for on my journey is my bestfriend. She's a cheerleader. The thing I am most grateful for on my journey is my new found love of sweating. With out exercise I wouldn't be where I am today weight and health wise. I'm most thankful for my fiance Marcus who is also on a weight loss journey. He keeps me on track and points out how much I have accomplished when I'm feeling down. The person/place/thing I am most grateful for on my journey is... my family and break-up. Seriously... it forced me to take a hard look at my life, and my family supported me 100% through it all. The thing that I'm most grateful for is the internet. I need the proof that I'm not alone. The person I am most grateful on my journey is...myself. I am the one that made the choices to become healthy. I am the one that got up and got to the gym and I am the one that I hold accountable. I can't put my success or downfalls on anyone else except myself. Right now I'm in a tough period of my life and need to figure out how to get back on top. No one else can help me...I am the only one who can figure out that lucky piece to pick myself back up and say stop being a baby and move on!!! I do owe a little credit to my ex husband as he was there through most of my journey and helped out as much as he could. Even though I'm not with him anymore, he still deserves the praises for putting up with me during those moments and even the times I was away from him and at the gym working away.